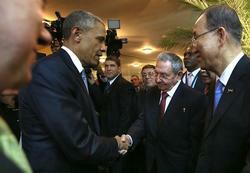 Equipo Nizkor - Obama in historic talks with Castro but Cuban leader in no mood for a love-in. They might have been the first face-to-face talks between the leaders of Cuba and the United States for more than 50 years, but when Raúl Castro met Barack Obama on Saturday he appeared in no hurry to make up for lost time. "We are willing to discuss everything but we need to be patient, very patient," the Cuban president said to his counterpart in their first formal encounter since the announcement in December that the two former cold war rivals will move to normalise relations. Obama struck a more upbeat tone during what he called a "historic" meeting. "We are now in a position to move … toward the future," he said. "Over time, it is possible for us to turn the page and develop a new relationship between our two countries." The brief encounter, which took place on the sidelines of the Summit of the Americas, contained few specifics. Obama said he would be making a decision in the coming days on Cuba's status as a state sponsor of terrorism after an inter-agency review. Priorities differ. During a speech earlier in the day, Castro called on the US to lift the embargo on his country and to return Guantánamo Bay, which he said was illegally occupied by the US military. The meeting between the two men followed an often heated plenary session in which Obama tried to focus attention on the possibilities of closer regional ties, while leftwing leaders lined up to remind the US of its past aggression and interference in the hemisphere. This was no love-in and there were several bitter jokes. The leaders at the plenary were restricted to eight minutes for each speech but Castro said he was entitled to 48 because he had been excluded from the previous six summits. He went on to use all of that time and more in a sometimes rambling, finger-jabbing speech that attacked the US for its embargo on Cuba, its occupation of Guantánamo Bay and other wrongs. However, he struck a warmer tone towards Obama, who he said was not responsible for the deeds of the previous 10 US presidents. "I apologise to President Obama for expressing myself like this. I get very emotional when I talk about the revolution," he said. He then struck an almost affectionate note in describing his admiration for the US president. "In my opinion, Obama is an honest man … I admire him. I think his behaviour has a lot to do with his humble background," said Castro. He called on the other leaders to help the US president in his effort to persuade Congress to lift the trade embargo on Cuba. Castro, 83, said he did not give the personal endorsement lightly. "Believe me, I gave a great deal of thought to these words. I wrote them down and removed them and now I have said them, I am pleased I said them." Several other leaders expressed a similar mix of personal admiration for Obama and suspicion, anger and frustration at US policy in the region over the centuries. Addressing the session, the US president joked that, as a student of history, he always enjoyed the lessons he received at the regional summits but struck a serious note in acknowledging the "dark chapters" in the US's past, when its actions towards its neighbours had not matched the human rights ideals it espoused. But he urged leaders to look to the future and capitalise on the "new chapter" in US relations with the region. "The cold war has been over for a long time and, frankly, I'm not interested in having battles that started before I was born," he said. "The US will not be imprisoned in the past. We're looking to the future." Current frictions were also evident. While US relations with Cuba have thawed in recent months, those with Venezuela have worsened, partly as a result of Obama's executive order imposing sanctions on seven officials in Caracas accused of human rights abuses. The regional body, Unasur - which represents every nation in the hemisphere except the US and Canada - has unanimously condemned the sanction order, which declares Venezuela a threat to US national security. Venezuelan president Nicolás Maduro said a lifting of the "threatening" and "dangerous" executive order was essential for the safety of his country and claimed the US embassy in Caracas had been preparing a coup and an assassination attempt on him. He said he had evidence, but presented none. "I respect Obama but I do not trust him," Maduro said. "We're not against the US. I'm an admirer of Eric Clapton and Jimi Hendrix. We've never been against the US. We're anti-imperialist." This appears to have been a partial mistake. Clapton is British. The US president had left the plenary before Maduro started speaking and the two leaders appeared to have avoided shaking hands during the summit. Earlier in the day, Obama suggested some leaders were using conflict with the US to distract attention from domestic woes. Venezuela is suffering recession, shortages of basis goods, deadly street protests and the highest inflation rate in the world - a crisis that has become a source of concern for the region. Brazilian president Dilma Rousseff said the situation in that country demanded restraint and criticised the US sanctions, while urging dialogue between the government and the opposition in Venezuela. Like every other leader at the summit, she celebrated the move by Cuba and the US to build closer ties and said countless opportunities should emerge from the new regional environment. "The two presidents have shown the progress that can be made when we learn the lessons of the past."